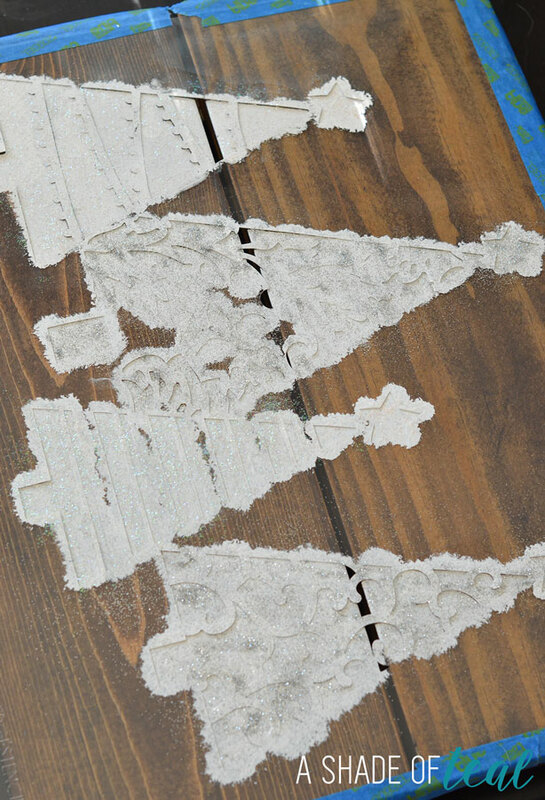 This post has been done in collaboration with Cutting Edge Stencils. All opinions and comments are 100% mine, I only promote products I believe in. 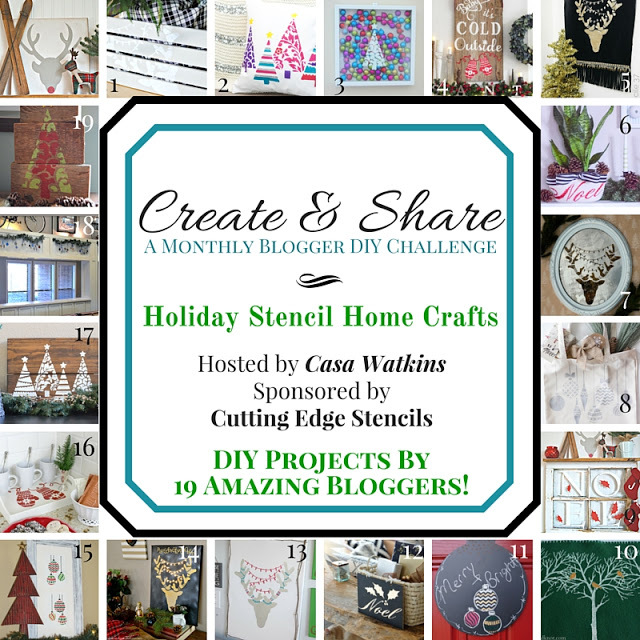 I’ve teamed up with some amazing bloggers and Cutting Edge Stencils to create another project with Stencils. 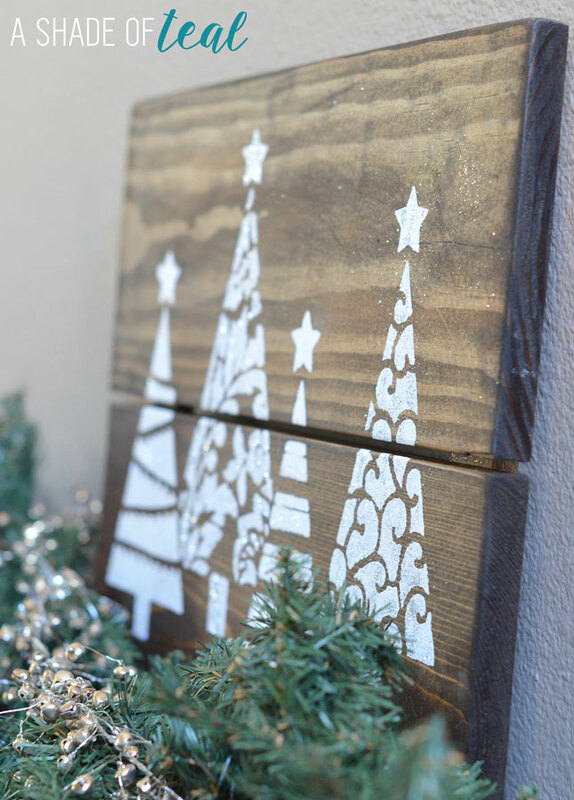 This time I made a DIY rustic Holiday sign. 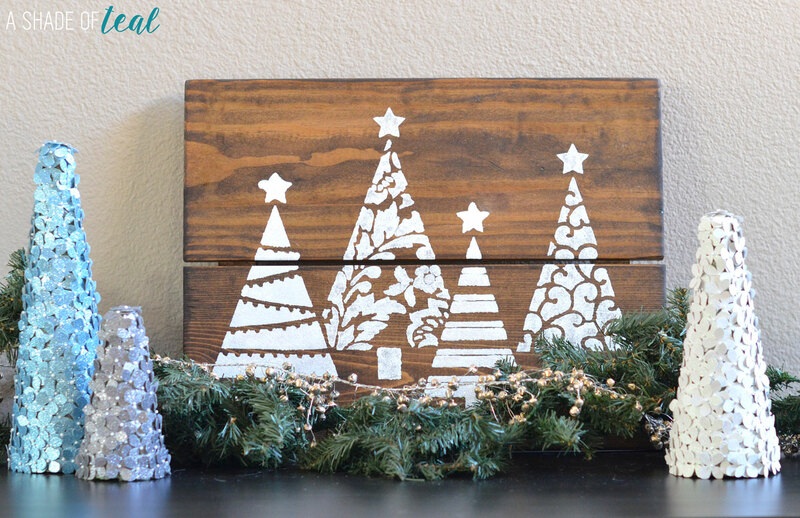 I first selected my stencil from Cutting Edge and picked their Fancy Christmas Trees Craft Stencil. Once I received it in the mail I found some scrap wood that would fit the sign. 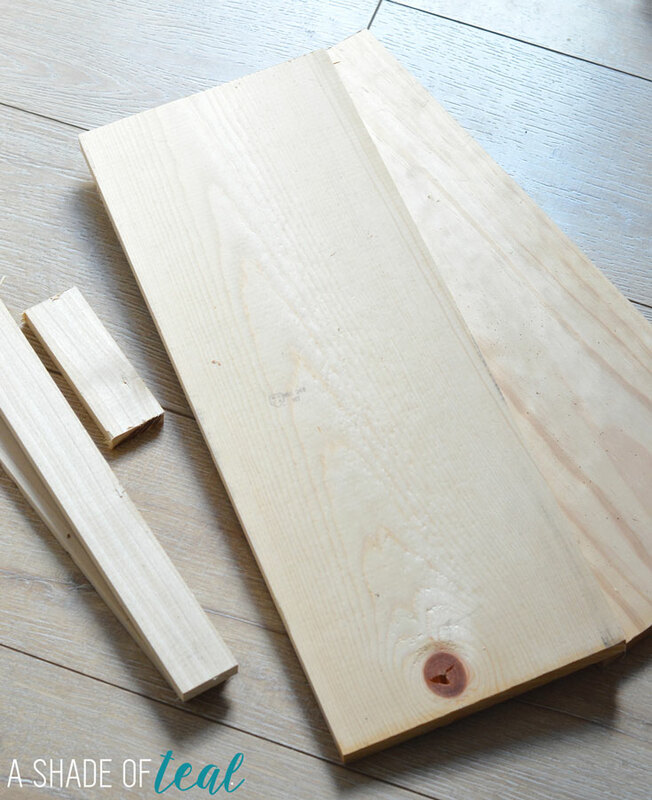 After I cut the wood to size I assembled it with a nail gun like so. Next, I sanded the entire thing making sure the edges were nice and round. I then stained the sign with my favorite Minawax stain in Dark Walnut. Once the sign was dry I cut the stencil down so I could easily tape it to my sign. Then I started painting each tree. 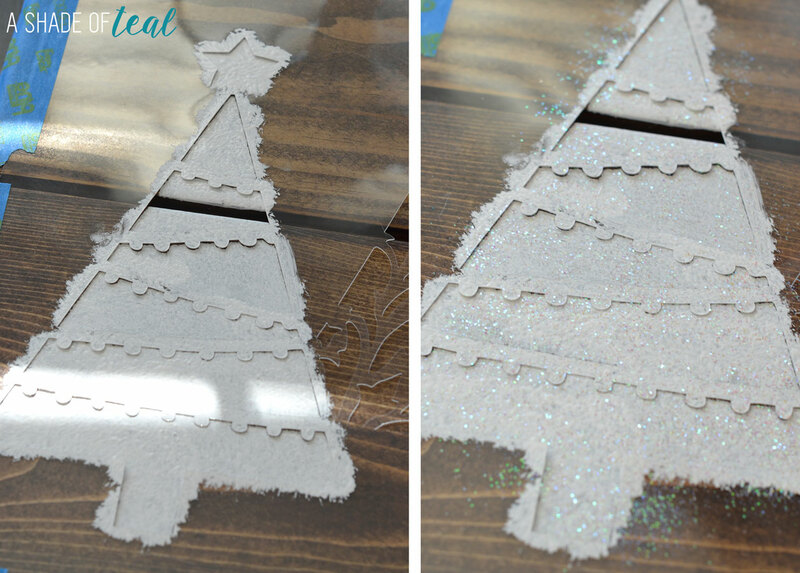 I would paint 1 tree then sprinkle on clear or silver glitter. After I finished 1 tree I moved on to the next so the paint wouldn’t completely dry before I added glitter. I let the entire thing dry and that’s it! I have my sign displayed on a buffet, but I made it so it can also be hung. I love how it turned out, simple yet rustic looking. Its fits perfect with the rest of my decor. 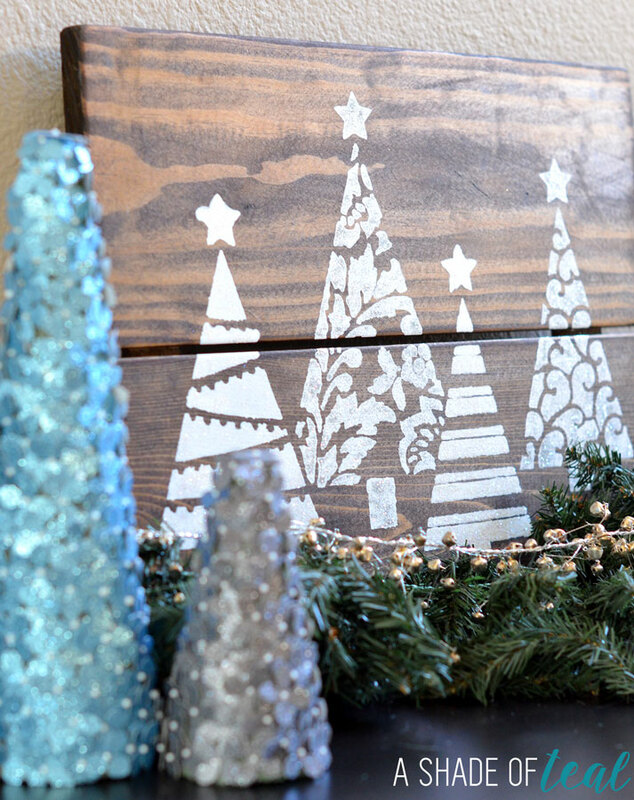 Make sure to stop by everyone else’s blog to check out their Holiday Stencil Craft. Also, if you would like to enter for a chance to also win a Cutting Edge Stencil, you can here. It’s beautiful Katy, and I love that it’s so simple to make!! 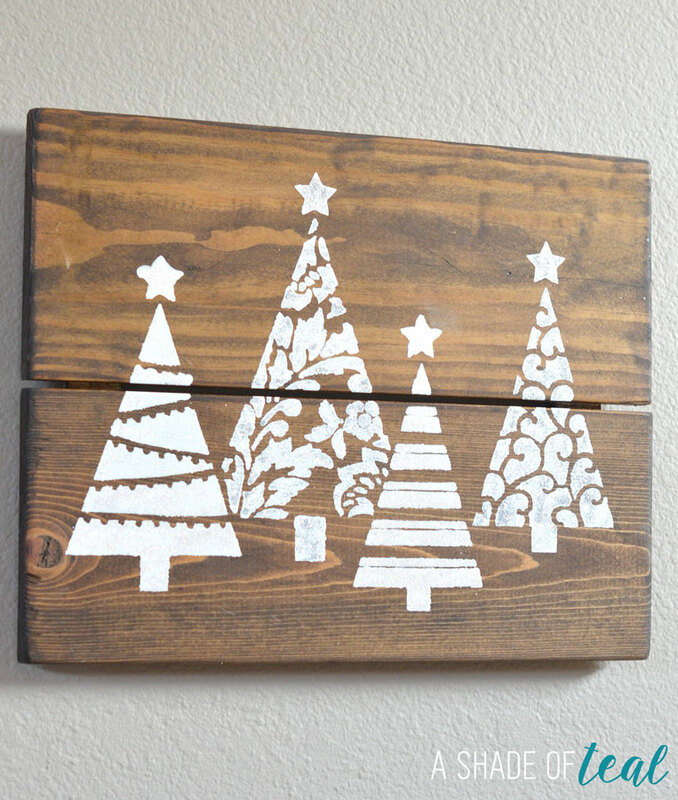 Ohhhh you had me a stained wood and white! Love this sign. It’s so my style!!! Great pictures too Katy! I love this! It’s beautiful and I love the colors. The board is perfect! So pretty Katy! I love how simple your project is! Is allows the trees to really speak for themselves! It really turned out beautifully! I want one now! Thank you for sharing. I’m pinning your project! I LOVE THIS!! 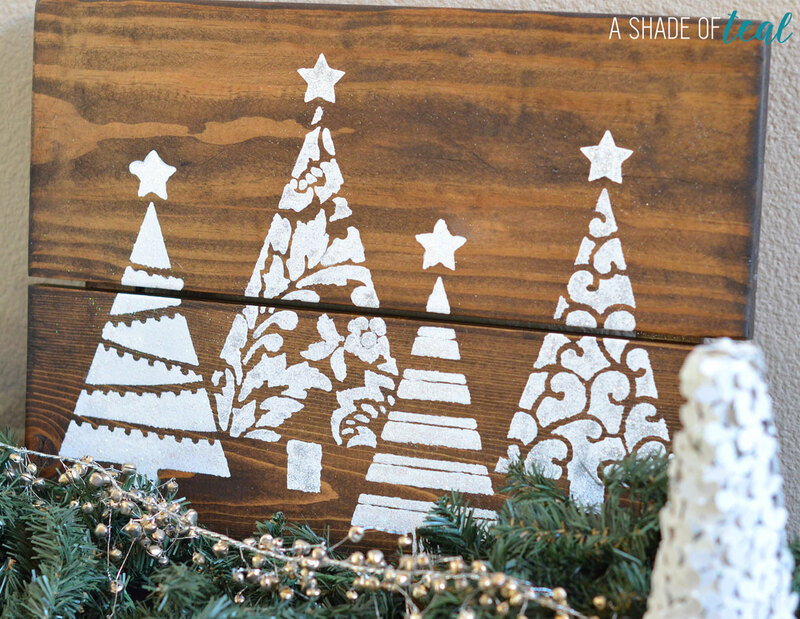 I love the wood with the stencils and the glitter!! Perfection! I made a pillow but I may have to recreate this because I love it so much! I love the stain you chose! It looks great with the white trees! This is such a lovely project, Katy! 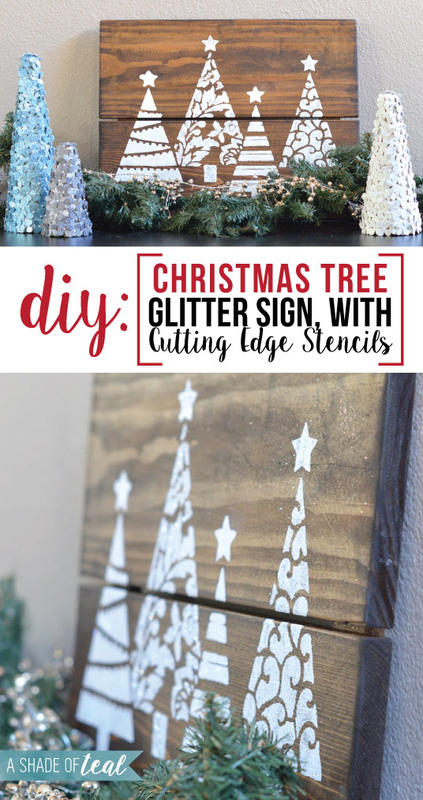 Love how you added the glitter and your choice of wood stain. It looks great on the buffet! your project turned out GREAT and the wood stain is gorgeous. I love the sparkly snow affect on your pretty trees! This really turned out great!!! The glitter totally makes this! I’m so excited to see how fast this challenge is growing! I’m so glad you’re a part of it!! xo! Hi ! Just saw this I didn’t know you could put glitter on wet paint Thanks!! I will be trying this soon. Just found your page will be following. Have a great day. Thanks Jody! Yep, the glitter works great with paint. I am always looking for new stencils. Do you have a catalog I could get for orders ? 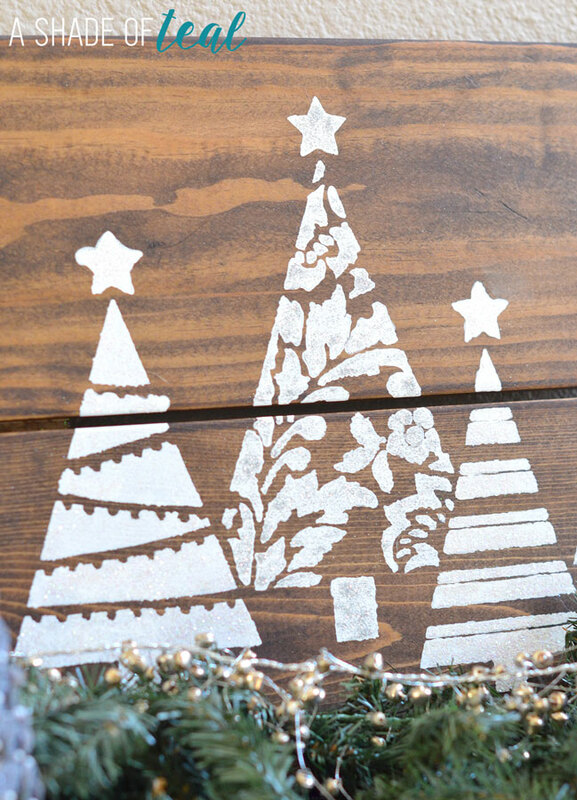 How can I get the FANCY CHRISTMAS TREE CRAFT STENCIL? Hi Gladys- The link for that particular stencil is at the top of this post. Otherwise, you can visit Cutting Edge Stencils website to purchase there. Thanks!